For artists who demand vibrant color and consistent results. 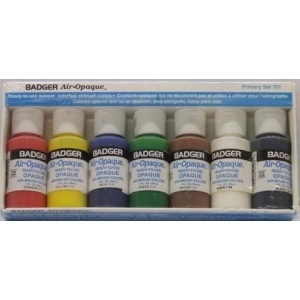 Air-Opaque offers an exciting range of pre-reduced, color fast, waterbased, non-toxic colors,pearlescent colors and the option of mixing pearlescent white with colors to create a pearl effect. 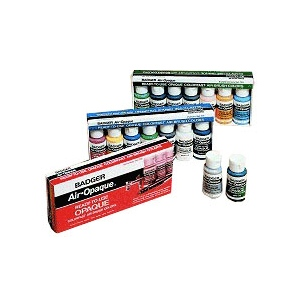 Used by illustrators and fine artists,they are formulated for usewith airbrushes,technical pens (not recommended with pearlescents), and paint brushes for use on paper, illustration board and canvas. Air-Opaque is formulated to make clean upof tools quick and easy. Air-Opaque is available in individual 1oz. (30ml) bottles, or in sets of seven colors. Air-Opaque cleaneris available in 1oz. (30ml), 4oz. (120ml), and 16oz. (480ml) easy-dispensing bottles. Choice of 30 non-toxic, intermixable colors, 8 pearlescent colors,plus clear coat. This product is shipped from our warehouse in Franklin Park, IL, USA.